Get Vendio Gallery - Now FREE! Original REED CRANDALL unused Topps 1962 Trading Card Set "Civil War News" Art. This overall 6" x 7-1/2" small painting (actual size is 3-1/2" x 4-1/2") is EX condition; RARE. 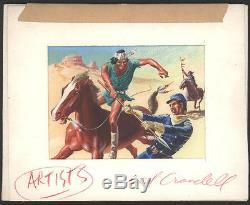 The item "Original REED CRANDALL unused ToppsCivil War News Art" is in sale since Wednesday, December 23, 2009. This item is in the category "Collectibles\Comics\Original Comic Art\Drawings, Sketches". The seller is "amazing-adventures" and is located in San Mateo, California. This item can be shipped to United States, Canada, United Kingdom, Denmark, Romania, Slovakia, Bulgaria, Czech republic, Finland, Hungary, Latvia, Lithuania, Malta, Estonia, Australia, Greece, Portugal, Cyprus, Slovenia, Japan, China, Sweden, South Korea, Indonesia, Taiwan, South africa, Thailand, Belgium, France, Hong Kong, Ireland, Netherlands, Poland, Spain, Italy, Germany, Austria, Israel, Mexico, New Zealand, Singapore, Switzerland, Norway, Saudi arabia, United arab emirates, Qatar, Kuwait, Bahrain, Croatia, Malaysia, Brazil, Chile, Colombia, Costa rica, Panama, Trinidad and tobago, Guatemala, Honduras, Jamaica.